← He says it can’t be done. Taking that “Y” right out of DIY: a bunny tea with The Little Palette. There is a constant dilemma plaguing the modern woman: To DIY or to do what I like to think of as the PIY- Pay it Yourself. The world (cough… Pinterest… cough) convinces us that we MUST do ALL OF THE ITS ourselves, that we must be accomplished in every domain. Truly, we have not evolved as far past a Jane Austen novel as we like to think.Yet luckily, there is a gleaming beam of hope on the horizon, a true miracle of capitalism in which we can let those who are crafty, craft. And those who are not, can pretend and support the endeavors of the crafty. A place that lets us take the “Y” right out of the DIY and still let homemade artistic beauty grace our lives. Hello Etsy, I’m looking at you. I recently organized a tea party/ baby shower for a colleague. I have learned a thing or two in my party planning years, and so instead of trying to everything myself, I outsourced. We went to Lady Camellia Tea Room in Georgetown, letting them make all the food and do the cleanup. Yet I still wanted a special artistic touch… and I absolutely did not want to do all the work myself. Luckily, my amazing sister-in-law Laura recently opened an Etsy shop with custom watercolor paintings and prints. Laura is insanely talented, and I have been begging her to sell her stuff for years, and now that she gets time home with my precious butterball nephew, she decided to open her own Etsy shop, The Little Palette. All her stuff is adorable, but I especially love her animal watercolors. That blue elephant? I NEED HIM. My coworker mentioned that she was doing a garden/ bunny theme for her daughter’s nursery, prompting me to text Laura and beg for her to do a custom bunny print for the baby. 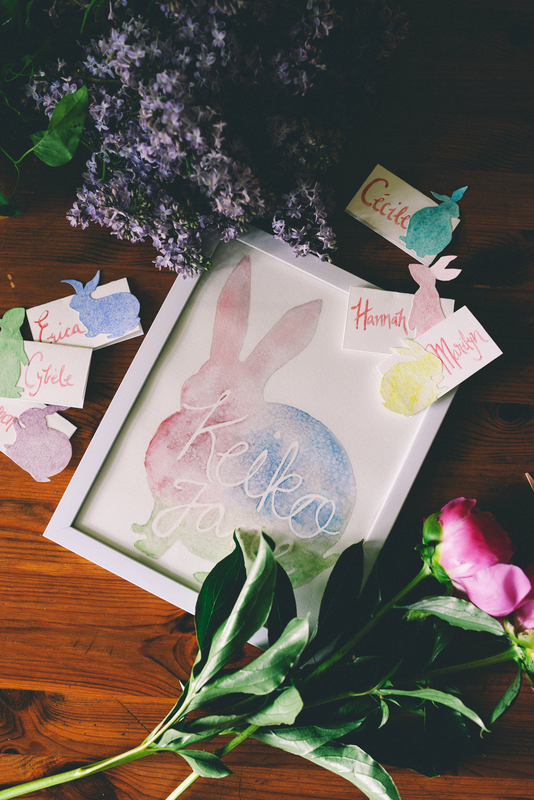 She did, and made me those precious bunny place cards. The result? A perfect tea party with personal touches for which I did very little work. Yes please. I mean, just look at those cute bunnies hoping all over the table. The only thing better would be REAL BABY BUNNIES EVERYWHERE.. but Etsy maybe hasn’t evolved that far. Yet. We can dream. Check out Laura’s shop, follow her on Instagram (pictures of my nephew are a bonus! ), and don’t hesitate to contact her about custom work! She’s the greatest, and you too can have custom artistic details for your next party without lifting a finger past you keyboard. 7 Responses to Taking that “Y” right out of DIY: a bunny tea with The Little Palette. Thanks for highlighting Laura’s talent…and for giving me permission to not do it all myself the next time I plan a shower or party. Yours looks like it was perfectly lovely and exactly right for the occasion! She is the loveliest and makes the loveliest things!!! I think of it sort of like missions–some people go and some people support. I am a supporter of those with the Gift of Crafting. Amen. Blessed be the facilitators. I have the Gift of Appreciation. I mean, I’m an ace with a glue-gun, but can’t do anything that involves neat handwriting or coloring in the lines. PIY. Heck yeah. You’re speaking my language. I mean, I like the idea of crafts…. but mine always look very much like CRAFTS not DECOR or PROFESSIONAL. I have just accepted my duty to fund others instead.